First of all: This site is neither maintained by Microsoft, nor does it contain any official software from Microsoft. All trademarks used in this blog are the property of their respective owners. Especially "Zune" which is a trademark of Microsoft Inc.
Zunplex (sometimes written Zuneplex) allows you to copy the music files of any playlist (that was created by the Zune software) to another folder or drive. This can be a memory stick, your (android) smartphone or a plain MP3 player. Zunplex can be downloaded from here. It is a plain exe file. Put it somewhere e.g. on your desktop - and just start it. It's completely free, contains no spy, adware or anything similar. Choose which playlist you want after pressing "Select zpl." 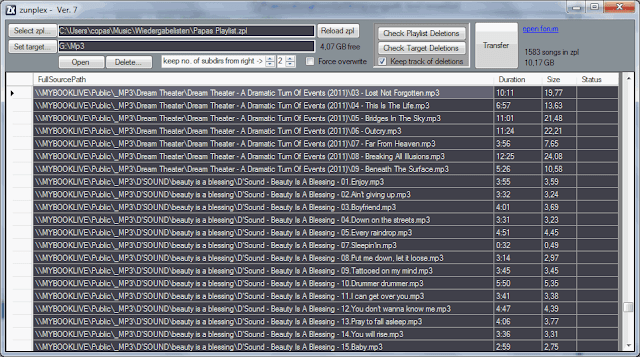 Choose in which target directory to you want the MP3s to be transferred. Hint: If you want to avoid some problems during accessing the playlist file you should keep the Zune software closed while using zunplex. If you want to write a message, e.g. to contribute some grammar corrections ;-) feel free to do so. Please combine the email address by putting "zunplex" at the beginning of "@gmail.com", thanks. Btw: The 1st forum where I had mentioned zunplex and got some feedback was Zuneboards (which is the zune forum that I know for many years now and I would recommend for every zune user). In the past there was a similar tool called "Translatum" (from developer AndroidPlusYou), but think this isnt anymore supported nor available. By the way, I dont need to connect my Android anymore by the USB cable but instead using a WebDav client (DavDrive Lite) that supports remote file access by wifi. zunplex is a small tool, but as any software out there, it probably contains bug and shows issues. I dont receive a lot of feedback about what is working out there and what not, but I guess there are simply not many users out there. Space problems in your target - Zunplex will not estimate if your playlist files fit into your target drive. If zunplex runs out of space during the copy process it will abort this transfer and you have to check yourself, which songs were copied and which not. This is not really a big problem, but other functions e.g. "Analyzation of deleted files" may give strange results afterwards. 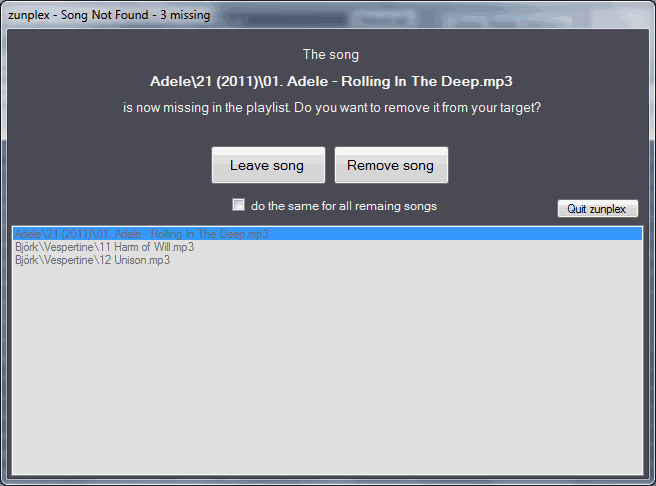 If you rename any MP3 file or move your songs within your target, this is something zunplex can not detect. This means, if you expect any intelligence from zunplex you probably get dissapointed here. So maybe you will end up having all your renamed files twice in your target (after you did a second "transfer" process) or, the "Analyzation of deleted files" will give you 'false' warnings. If you have a big playlist, the reading/loading of it may take a minute or more. During this timeframe the info box showing you the actual action could become unresponsive and a windows message could be shwon that "this app is not responding". But if you still wait a bit everything goes fine.